Here are some things I made for a scrapbooking swap that I am in. It is a 2-4-2 swap so I make 2 mini kits and send one to 2 different people and I will recieve 1 mini kit from 2 different people. Sorry I don't have a scanner so I had to take a picture. 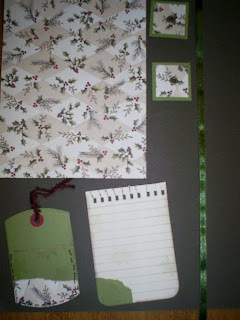 The kit includes half a sheet of 8 1/2 x 11 pattern paper, a tag, journal box, 2 little paper squares and ribbon. I also included a metal frame and 2 burgundy buttons that match the thread I used on the tag. The picture didn't turn out so great, but this is the journal box I made. 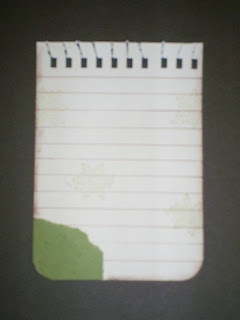 I started with a rectangle shaped piece of beige cardstock. I rounded the two bottom corners. At the top I used my filmstrip punch to make holes and then I broke the holes to give the appearance of a used sheet of note paper. I added lines with a brown pen, a peice of coordinating green paper in the corner and made some snowflakes using stamps and green ink. Lastly I chalked the edges with brown chalk. This is the tag. I cut 2 tag shapes from green paper. 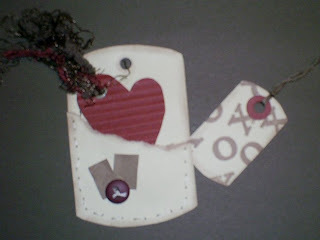 I paper tore 1 of the tag shapes and then chalked both of the shapes with brown chalk. 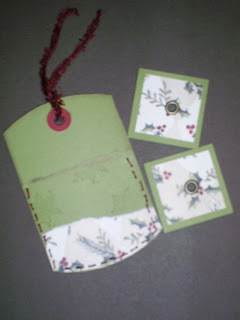 I added a little coordinating pattern paper to the bottom of the tag. I used 2 stands of burgundy embroidery floss to stitch together and create a little pocket tag. I added some green snowflakes to the tag as well. A burgundy accent to the top and burgundy yarn. The squares are made of a 2" green square and 1.5" pattern square with an eyelet through the center. For this I used 2 tag shapes cut from beige cardstock. I paper tore one shape diagonally and then chalked both with brown chalk. I stitched them together with 2 strands of beige embroidery floss, added 2 little crumpled rectangles and a small button to the front. The little tag beside it has x's and o's stamped with brown ink and chalked around the edges. 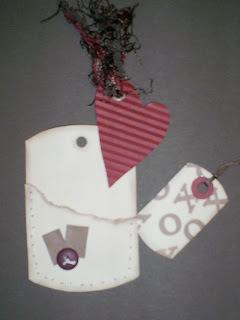 The heart is also a tag. I cut a folk heart shape and then put it through my paper crimper, added an eyelet and some yarn and embroidery floss. Posted by Lisa at 7:06 p.m. I just love your work here. You've done a very nice job. Whoever receives your swap projects should be very happy. I, only recently, began to scrapbook. It's quite fun, but so time consuming. Sometimes I walk away from my table with a slight headache because of the deep concentration. I've had more experience with card making. But now that I've started scrapping, I think I like it better. January 25, 2007 at 12:30 p.m. I'm into card making too. I started scrapbooking first and then got in to stamping cards. I bounce between the two. When I get bored with one I go and work on the other for a while. My son loves his 'story' :o) That's what he called it back when I started scrapbooking his album when he was about 2.5 yrs old. January 29, 2007 at 11:02 p.m.